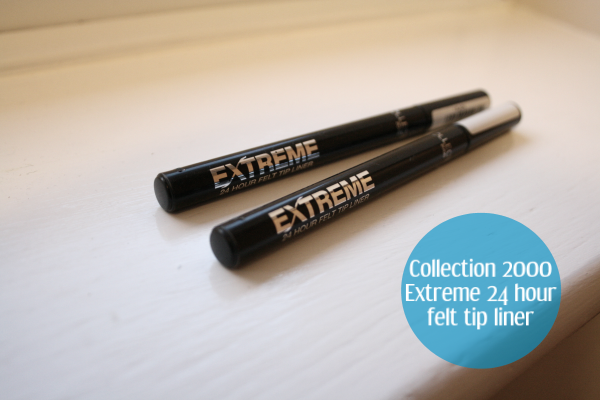 The Collection 2000 extreme twenty-four hour liner is my most used product from my make-up collection, as I use it every day without fail since I first brought it around two months ago. I am so impressed with it, and I didn't expect it to be so good for £2.99. When I first brought this around two months ago I did a mini review of the product on my blog here, where I reviewed this liner as well as the killer curves mascara, which I have come to conclude I don't really like that much, and I completely forgot I had it until the other week when I found it at the bottom of my make-up bag. On the mini review, I discussed how pen liners run out so quickly and that I hoped this wouldn't be the case with this one, and it really isn't, which is the main reason why I keep using this liner. As you can see in the photo I have brought two of the liners, this is because I came home from university at the end of March, and I wasn't sure how much longer the liner was going to keep up to my standards, so I purchased another one just to be on the safe side, but to my surprise, I am actually still using the first one I brought around two months ago! To me, that is a long time for an pen liner to not run out! 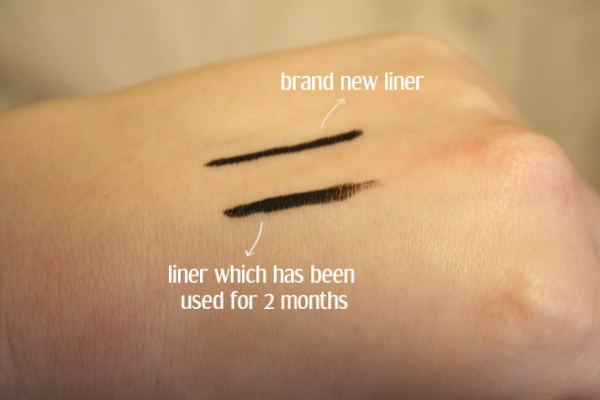 Although the 'two month old liner' is not as black as the brand new one, I don't find it unusable. I am still completely happy with the shade. As you can see in the photo above, the liner does begin to fade near the end of a stroke, but it can easily be sorted with a few coats on the eye lid. I find the application really easy and almost effortless, and the tip is particularly great for doing cat flicks and also getting a good even stroke. It also dries really quickly and doesn't transfer onto the top of my lid, which is great. Also, the liner stays in place all day and doesn't seem to smudge at all for me. Overall, I think the extreme twenty-four hour liner is perfect. It meets all my required needs for a basic eye liner pen and is very lasting on the eye as well as the product in general. I've been using this product for around two months, and I still think I would get at least a few weeks more out of it. 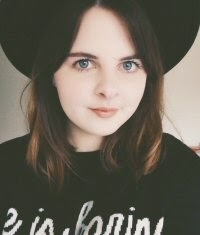 At £2.99, it's cheap enough to wear until the colour begins to fade, but being a student on a tight budget, I'll be wearing this until I'm completely unhappy with the colour. I will definitely be repurchasing this product after I've run out of my second one, unless I read about something mind blowing.